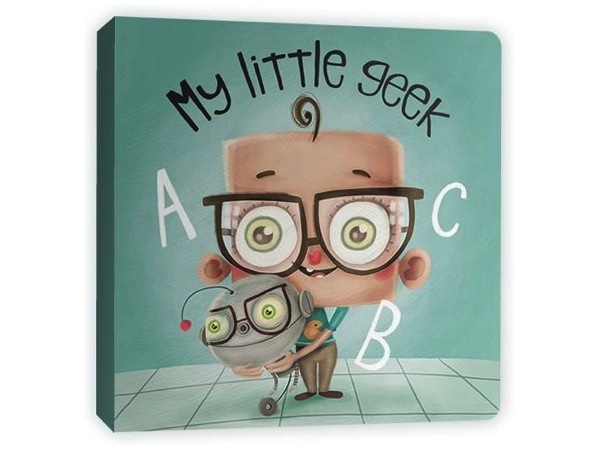 Adafruit Holiday Gift Guide 2013: Books for Young Engineers « Adafruit Industries – Makers, hackers, artists, designers and engineers! 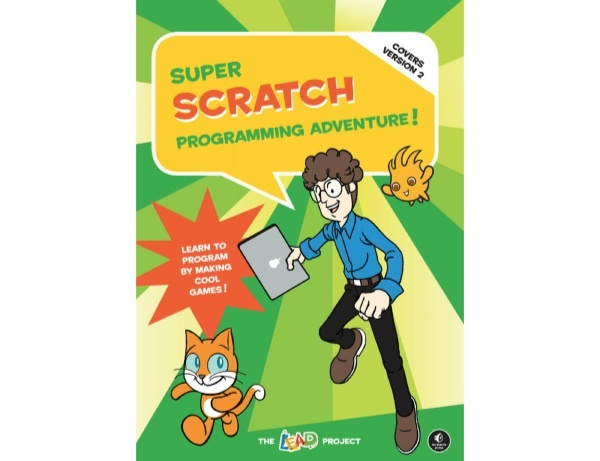 Books Available Now at Adafruit for Young Engineers! 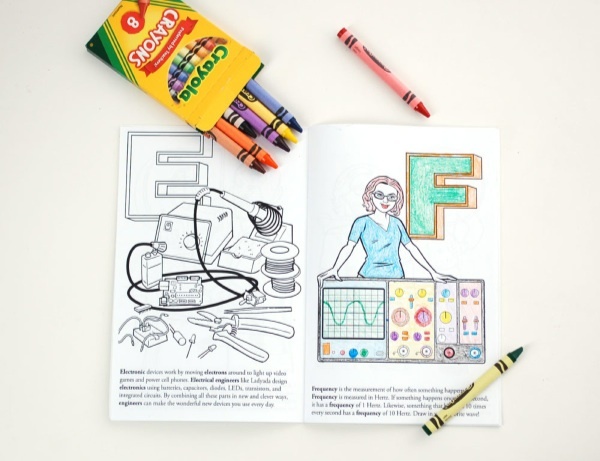 Coloring book – “Ladyada’s E is for electronics”: A coloring book adventure with electronic components and their inventors. Makers of all ages can learn, color, and share common parts and historical figures throughout history. Explore the world of electronics with Ladyada as your guide! 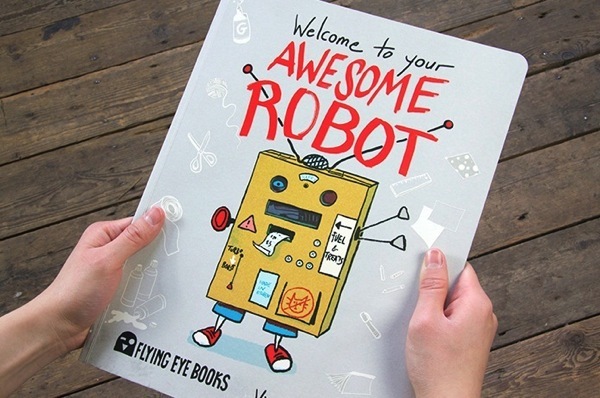 Welcome to your Awesome Robot by Viviane Schwarz: This is a early-learning activity book for Young Makers (sug. 5-7 years) with some cut-out/popsicle-stick/glue/rubber-band type projects. No electronics and soldering so its very simple and safe. We think it’s an adorable introduction to having robot friends. This is a large format, 32 page book with many big pictures and diagrams. Build your very own awesome automaton step by step from a base unit to the towering, terrifying, tremor-triggering robot of your dreams. This book provides everything you need to create a robot costume from objects you’d normally just throw out and have a fun day in! Designed to be enjoyed by children with an adult on hand – this book provides perfect material for a fun family activity day or a kids’ workshop. Viviane Schwarz has illustrated hilarious comics throughout the book to explain the blueprint instruction pages, so this is just as much a story as it is an activity book. 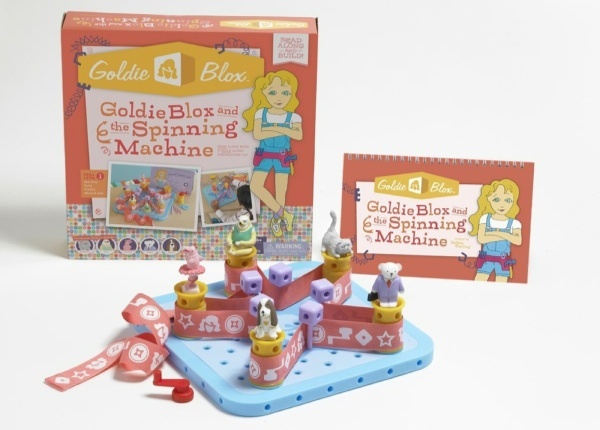 Goldie Blox and the Spinning Machine: Goldie Blox is a fun combination of storybook and engineering. Follow the leading lady, Goldie, in her quest to solve problems with engineering skills! In Goldie’s debut story, she decides to build a spinning machine to help her dog, Nacho, chase his tail. Soon, the whole gang wants in on the action. Help Goldie build a belt drive to spin everybody! Its a great introduction to mechanics and the joy of basic robotics for children and curious learners. 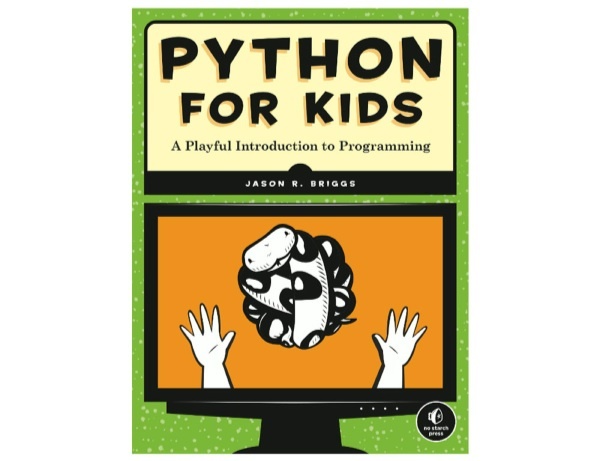 More Great Books for Young Engineers from Beyond Adafruit! 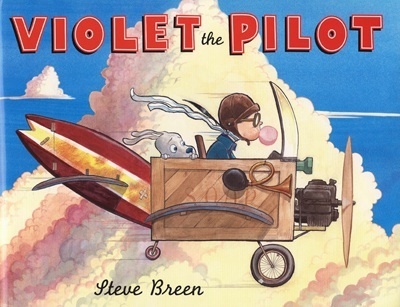 A beautifully-illustrated tale of a girl and her dream to become a great engineer. 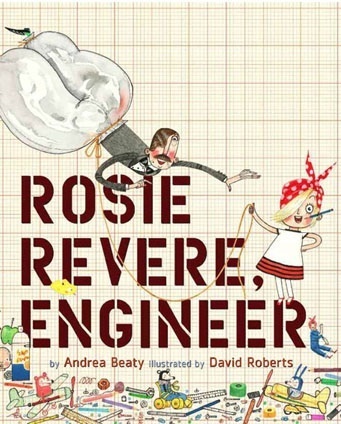 Where some people see rubbish, Rosie Revere sees inspiration. Alone in her room at night, shy Rosie constructs great inventions from odds and ends. Hot dog dispensers, helium pants, python-repelling cheese hats. Rosie’s gizmos would astound—if she ever let anyone see them. Afraid of failure, she hides them away under her bed. Until a fateful visit from her great-great-aunt Rose, who shows her that a first flop isn’t something to fear—it’s something to celebrate. By the time she’s two years old, Violet Van Winkle can fix nearly any appliance in the house. And by eight she’s building elaborate flying machines from scratch—mind-boggling contraptions such as the Tubbubbler, the Bicycopter, and the Wing-a-ma-jig. The kids at school tease her, but they have no idea what she’s capable of. Maybe she could earn their respect by winning the blue ribbon in the upcoming Air Show. Or maybe something even better will happen—something involving her best ever invention, a Boy Scout troop in peril, and even the mayor himself! EVERYTHING CAN BE USED AGAIN! That’s Dawson’s motto. He collects junk that people throw away and turns it into something STUPENDOUS. 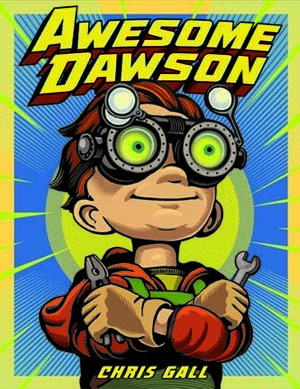 But when Dawson uses his skills to create a machine to do his chores for him, he discovers he might have invented something a little too… AWESOME. Can he stop the rampaging robot before it destroys the entire town? 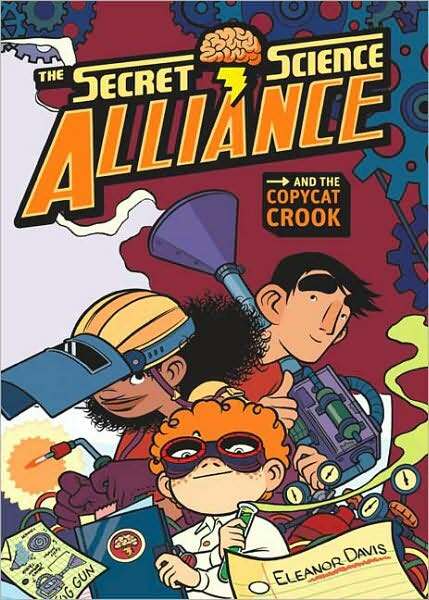 The Secret Science Alliance by Eleanor Davis: A graphic novel following the adventures of three kid inventors and all the wacky stuff they make. Super-smart Julian Calendar thinks starting junior high at a new school will mean he can shed his nerdy image–but then he meets Ben and Greta, two secret scientists like himself! The three form a secret club, complete with a high-tech lair. There, they can work to their hearts content on projects like the Stink-O-Meter, the Kablovsky Copter, and the Nightsneak Goggles. All that tinkering comes in handy when the trio discovers an evil scientist’s dastardly plan to rob a museum. 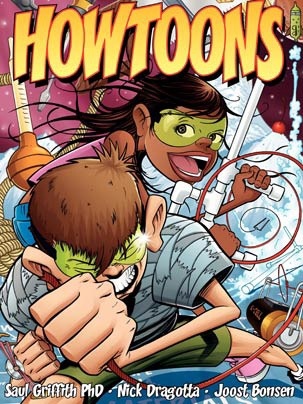 Can three inventors, armed with their wacky creations, hope to defeat this criminal mastermind?